You’ve all heard of 4K, which I’ve explained in my article: What is 4K TV? In it, we questioned its utility in the real world. But what is this 8K TV? Was there a need for it at all? ‘8K’ is an unofficial term to represent an image with approximately 8000 horizontal pixels. This follows the precedent laid down by the well known conventions 4K and 2K, which both roughly mean 4000 and 2000 horizontal pixels respectively. 8K is said to be ultra high resolution. In August 2012, the ITU (International Telecommunications Union) ratified a series of standards that they officially called Ultra High Definition TV, or UHDTV. 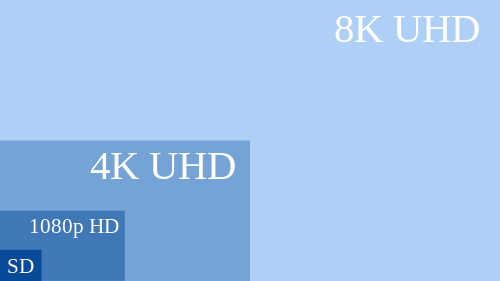 Since neither cinema nor television has any existing 8K standard, we can safely assume that 8K will conform to UHDTV. Unless of course, Red comes up with a new specification of their own and changes everything. As you can see from the above image, 8K is four times the size of 4K, and sixteen times the size of 2K or 1080p. If you were to measure the resolution in megapixels, 8K 7680 × 4320 is 33.2 Megapixels. In comparison, the Nikon D800 shoots 33.6 MP at 7,360 × 4,912. Is resolution the only advantage to 8K? Actually, no. 8K TV is a totally new paradigm. It is actually mind-blowing in scope. If 8K and 4K are two different things, why are both called UHDTV? Anyone remember how confusing it was when HDTV first came out in the market? The average consumer didn’t know the difference between 720p (HD-ready) and 1080p (Full HD). Many still don’t, but that’s another matter entirely. Of course, the ITU and the high-and-mighty forces of the universe thought it was a good thing to let consumers remain in doubt. In August 2012, when the ITU officially ratified UHDTV, they repeated this very same farce. Why? Surely this is no longer a ‘mistake’? I don’t know the answer to this, but I do know as a consumer I, too, am responsible for accepting what they dish out as wisdom. The answer to my own question is: Nobody knows, and rather than waste time thinking about it, one hopes the smart consumer will read the fine print and find the actual specifications of the device he or she is going to purchase or use. I really enjoyed the part where they claim 8K will reduce ‘Channel Zapping’ or Surfing – the tendency of a viewer to change channels when bored. Very interesting. I would love to see a study conducted on this when the novelty wears out. Also note the part where he uses the words ‘4K layer’ and ‘8K layer’. We might also see the terms UHDTV1 to represent 4K and UHDTV2 to represent 8K. How soon will you see 8K TV in your Home or Cinema? According to NHK, the pioneers of the 8K ‘Layer’ of UHDTV, the standard will be ready for mainstream use by 2020 (hence the name Rec. 2020?). 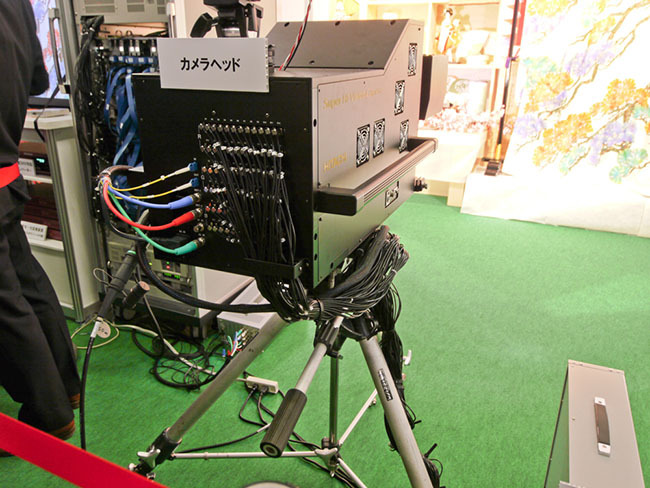 I wonder, why didn’t they use the NHK name for it: Super Hi-vision, at least as a tribute? There are reports that the first widespread television sets for the general public might appear as early as 2014-2015. Exciting? Or overkill? Do you need 8K at home or cinema? What you can see immediately is that 8K allows us to sit closer. Anything smaller than a 42″ display will need to be viewed at one feet. In fact, it will be as good as reading a high-quality magazine printed at 300 dpi. If you go further away the extra resolution from 8K is lost, as I’ve explained here. The 85″ 8K TV displayed by Sharp at CES 2013 will need to be seen at about 4 feet for it to look like a 1080p computer monitor at one feet. The average human eye doesn’t need much better, as I’ve written in the Resolution of the Human Eye. Is it just me, or does anyone else feel 4 feet is way too close? What if you are a family of 10 wanting to watch a movie? How many of you can sit within the 22.2 audio area four feet away from your 85″ 8K TV? Probably it’s for this reason why consumer 8K TV is 85″ or more (at least for now). The lower size displays with 8K will be very handy for medical and scientific applications, but are not practical for home or consumer use. It’s overkill. What about cinema? As you can see, a 600″ display (about 45 feet wide) should be viewed at a distance of 20 feet. 20 feet is the length of three humans, people. This is bigger than IMAX. How practical is it? How many people can sit inside the width of a 45 feet wide display? A comfortable airline seat is about 20 inches. Let’s even it out at 2 feet for easy calculation. A 46 feet width can hold 23 people. Anyone outside this range will also not get the full effect of 22.2 sound, even though the cinema owner might convince them: ‘It’s the same thing’. Only a few rows in front and behind this ideal distance (0.75x height) can actually see a huge difference when compared to 4K. The rest of the public will not know it, even if they have paid for it. Five such rows is 100 people. Food for thought? All said and done though, in the real world, 1080p isn’t really 1080p. A lot of resolution is lost in lens, camera, debayering, sampling, transcoding, post production, compression, broadcast and delivery. The same is true for 4K and 8K as well. I have no doubt that 8K is the pinnacle in imaging, and by trying to attain this we are actually cutting down on the errors in the chain. It can only help, right? What do you think? Do you feel 8K TV is even worth bothering about? Would you buy one if you could afford it?